I really like Gene Doucette's writing style and was excited to see a new book coming out from him. Fixer did not disappoint. The caliber of writing that fans of Immortal have come to expect of Gene will find it within the pages of Fixer. Fixer reminded me of the late nineties television series Early Edition. I loved that show so I easily slipped into the story of a man who "sees" the future and tries to fix what is wrong. Corrigan is also haunted by his past "failures" - the times where he was unable to change the future. Again, in true Doucette fashion, the "fantasy" world he's created has a solid scientific basis. The science nerd in me loves it. I recommend reading the book over a short period of time. January and February are extremely busy months for me and it took me most of January to read it. I think I lost the momentum of the story because it was definitely one who won't want to put down. The book is filled with flashbacks to Corrigan's childhood. Most are short and interesting look into his life. However, the extended hospital flashback did not help me regain the momentum that I was losing due to spaced out reading. I felt is was overly descriptive. Really who but maybe middle grade boys want to read descriptive vomiting? When I finished Fixer something felt off about the ending. Maybe too many details that weren't alluded to earlier were revealed making it feel rushed or maybe there wasn't enough of an explanation. Also there was a certain thing (I don't know how to describe it without giving away too much) that I'm not sure if it was because I was reading an ARC or if it really was meant to be like that. All of this left me very unsure how I felt about how the book ended. That's the problem with reading ARCs - no one else has read the book so I don't have anyone to talk to about it. And I really think it would help if I could talk about it with someone (Fixer would make a great book club read). I would love to hear your thoughts. 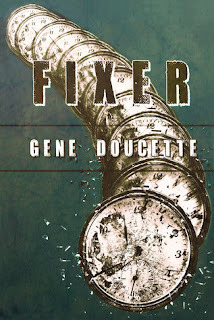 Fixer by Gene Doucette is available March 21 and I highly recommend reading it. A free book was obtained from the source mentioned above in order to provide an honest and free review.